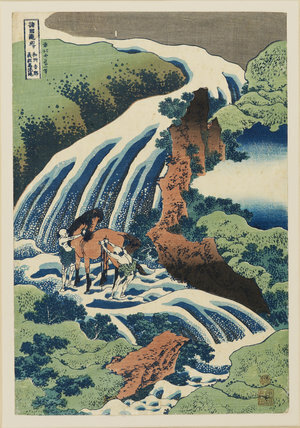 The Yoshitsime Horse-Washing Fall. Yoshino, Province of Itsumi. Michi-zane Suga-wara visiting the Temple on Mt. Tamuke Nara, the scene of his poem. In the grounds of the castle of Wakasa-no-suke Honzo, in the presence of Wakasa, cutting off the branch of a pine tree. The Yoro Fall, Province of Mino. Fuji seen from Isawa, Kai Province at daybreak rising out of the mists. Faint pink in the sky & gauffrage.